I've had my Android phone configured to use WiFi when I am at home and other WiFi-equipped places I frequent. This reduces my wireless phone data usage and usually gives me faster data transfer. However, I've just discovered that doing so stops Skype. Enabling WiFi on my phone disconnects Skype. There is no warning about this when I disconnect. In fact, I the "Ongoing" status information continues to display "Skype mobile: Signed in". The warning comes when I manually open the Skype application that is supposedly already actively connected and running. 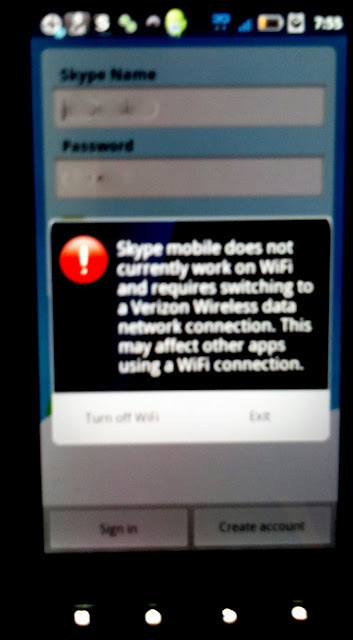 For what technical reason should my using WiFi instead of Verizon Wireless' network to access the Internet disable Skype? Prior to the Verizon Wireless Skype Mobile partnership deal, I had a Skype Mobile application that worked well regardless of how I connected my phone to the Internet. Now users have the choice of using the slow expensive Verizon Wireless data connection or having no Skype on their phone while at home. They can't have both.